The first half year I taught, I did not smile. I did not suffer excuses. I frequently wrote students up. Granted, I walked into a unique situation. I've written about it before, so I won't go into detail here, but suffice it to say that I took over classes mid-year in a troubled urban school after the teacher had been fired. I did help bring order to chaos, and it felt good to have "succeeded," but I was miserable. I've recently concluded that I was so miserable because I entered a culture of chaos that somebody else had created and instead of trying to reshape it into a positive culture, I simply managed the old culture to death. That was exhausting. "Classroom Culture" has become an educational phrase du jour, on the menu right alongside "Growth Mindset," "Flex-Grouping," "1:1," "Blended Learning," "Differentiation," and "Formative Assessment." In education, we often hear phrases thrown around without a lot of advice as to their practical implementation. Merriam Webster defines culture (the kind we're discussing) as "a way of thinking, behaving, or working that exists in a place or organization (such as a business)." Merriam Webster defines positive (the kind we're hoping for) as "thinking about the good qualities of someone or something: thinking that a good result will happen: hopeful or optimistic." So let's talk implementing a positive classroom culture, one aspect of Webster's definition at a time. We should focus on our students' good qualities. Everybody has them, and we need to find them. Even when they are misbehaving, we should not allow that to define who they are for us. We should address and have consequences for misbehavior, but we should always look for the positive in our students. They should see that we are optimistic about who they are. On the first day of school, I have students fill out an index card. One of the things they put on it are their interests. I try to ask them about those interests and even bring them into lessons (usually tied into bellringers) and attend extra curricular events when I can. - Classical Greece: A student mentioned she liked the Percy Jackson novels, so I showed a clip from the film and we discussed how it tied into the mythology we had been discussing. She was a quiet student but ended up leading that discussion. - Middle Ages: I had a student who didn't have much success in school but competed in archery tournaments explain a demo of the English Longbow that I had shown from YouTube as a bellringer. Not every student feels good about our respective subjects. If we behave as if we know that they are more than a grade in our class, we are creating a positive culture for them. I work hard in my classroom. I work to plan lessons that I hope are engaging. I work to have grades posted in a timely manner. I take a lot of pride in my classroom. I work hard because I have hope that a "good result will happen." I expect for my students to do the same. I am optimistic that if I take the work seriously and do my part, then so will the students. When my son was three, I went to a talk on parenting led by child psychologist John Rosemond. One thing that he said really stood out to me. He said that in his younger days, he used to tell parents, "If you do this or that, you will get positive results." He said that he wished he could take all of his "method" talk back. Equations for good behavior imply that the onus of good behavior is on the parent or teacher and it negates the reality of the child's free will. All the parent or teacher can do is model for the child and expect to be obeyed. If the child chooses to do wrong, there should be consequences, but no amount of consequences can ensure that a child will choose right. And so it is with all of us (life, liberty, and all), and so it is in the classroom. Will they all follow my lead? Will they all think positively? Will they all behave optimistically? Will they all work diligently? Well, no, they won't. But that doesn't mean that I can't expect them to and model those behaviors for them. That is what creating a positive classroom culture is all about. Oh, and of course, have consequences in place. Consequences are very, very important. But we should never expect those consequences to control. That is exhausting. And it moves the onus of the students' behavior onto us. That's not where it belongs, and there's nothing positive about that. Want more insight into creating a positive classroom culture? I know I do! Check out these other posts on the same topic from other classroom teachers. Thanks to Desktop Learning Adventures and ELA Buffet for hosting! Leah, I love the idea of the index cards. What a great way to have a snapshot of your class at your fingertips. I can't imagine how hard it must have been to be the drill sergeant for the class you took over. I'm sure it was hard on everyone. It was tough--I'm glad it's in the distant past, but I learned a lot from the experience. thanks so much, Pamela! I love this so much! I love how you got to know your student (the one who liked Percy Jackson) and incorporated it into your lesson. That is such a great way to genuinely show your students that you care. I bet she loved that class and went home with nothing by positive thoughts about the day. I used to try the same approach at the beginning of the year of not smiling, writing kids up, and being hard and harsh. I think colleges like to teach that approach. 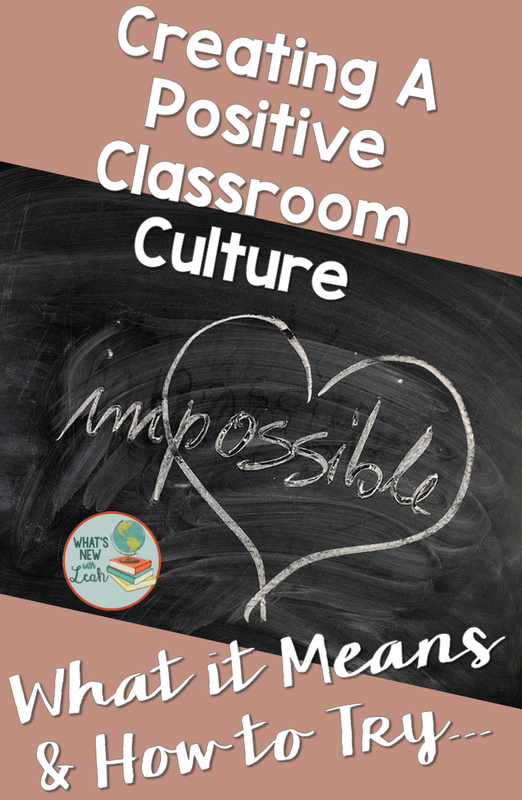 But you are so right, that the classroom culture comes from what we model, and to have a positive atmosphere you must be optimistic and model positivity and a love for where you are and what you are doing. Great post, Leah. Thanks, Brittany! Being harsh is exhausting--I know that went against your nature, too! I do think that's a good rule of thumb. Students need a model. Thanks for your comment! I love how you suggest infusing students' interests into your instruction. What a wonderful way to show them that you care...and make learning more meaningful! Thanks so very much!I know students seem to like it! I love what you said about free will. We all want our students to make the right choices but the onus is on the student. An excellent point! My favorite takeaway was "They should see that we are optimistic about who they are." If students know we are focusing on their strengths instead of their weaknesses, they will try to show us more good stuff! I used to have a colleague who claimed that she didn't smile until Christmas. I never could be that teacher. Like you I am filled with hope and optimism and belief in every one of my students. It is so important for our students to know that. I think I just found my new favorite blogger. I found two of your pins through a tailwind tribe and had to click on them to read the comment. One was this one and the other was the 5 pieces of best advice you ever received. I love the advice you give and am so glad I found your blog! Awe! Thanks so much Tamaralynn! Good information to know and right to the point on career in corporate. Thanks for this well written post related to search jobs , i’ll follow up for more updates if you keep posting them. Hi, very good post i have read... totally agree with you ... KautilyaCareers provides dsc model papers in telugu and dsc preparation material that help to crack the exam and help your bright future.